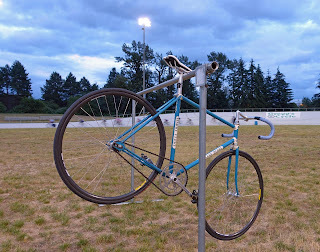 If you have followed along with my race reports you will know that I am racing the same track bike I raced when I was a school boy back in England, and that it was purchased second hand from a friend (who I recently connected again with through this blog). Over the years I have contemplated having it repainted but resisted the urge, it has the patina of time and use which money can't buy. That is to say to some it looks like a crappy banged up bike. Whilst to others it is retro cool. At a recent track day a rider outright said to me "I thought I was the only one with a crappy bike, but I've got a new one now" or something to that effect. I can remember being a little taken aback. Then moments later I was approached by another rider admiring my ride. Comments aside, like all good gear heads I could not help but be curious if a new bike would not feel or ride better. You know how it is, the thought wiggles in and before you know it your are researching your next ride. I looked at the latest bikes from the likes of Cervelo and BMC and browsed the Internet, shocked at how little information is available. I got really excited about the Cervelo T1 only to find out that they stopped production in 2012. I then asked a friend who builds frames to give me a quote for a steel frame, which I reasoned would be a great way to go. He produced some great drawings and I was almost at the point of pulling the trigger. Then like all things, reality kicked in and I realized, I have gotten sucked into the new stuff zone without really knowing what I wanted. Sure I could tell you the use but not what I wanted and how it would improve my riding. Then a conversation with my coach confirmed I needed to rethink my expenditure especially with the cyclocross season just around the corner. After all if I did get a steel frame built would it really be much different. Well I guess I will find out some other day as for now my old boy is still awesome in my eyes. Whilst inspecting the bike at the weekend I was horrified to discover that my bar tape had slipped. I felt like writing to the manufacturer and letting them know that the tape had slipped after a mere 30 years, well I would if I had any idea of the company. And so came an end to he era of zigzag blue bar tap. As I stripped it off Sarah gave a horrified cry of "what you doing?" I had to reply it's time, it served me well. Now one thing I did reason with was the benefit of new wheels, after all mine are 30 years old and going strong but 30 years old all the same. A little research and there seems to be some benefit to deep dish wheels other than they look cool. On the track fast wheels help you spin up quickly and once spinning, help you keep your speed. Here we hit the next challenge, nice wheels come at a nice price and I have hit my gear budget pretty hard this year so I decided to see if I could pick up a second hand pair. My patience paid off, ok I got lucky at the weekend, and today I picked up a set of Essor Areodash 88cm Carbon wheels from Craigslist at a fraction of the cost. Yes original owner, with receipt and we meet in a public place. No shady dealings here. I am not familiar with Essor but they seem to get good reviews so I took a chance. I will let you know my thoughts once they have been ridden in anger. I guess I am just in a curious mood right now but after having ridden 19 and 23 tires I was wondering at the weekend what a set of 26 or 28 would feel like. One good thing about an old frame is that I have loads of clearance to play with. Well no decision yet but stay posted and I will let you know what I experiment with as the current tires need to be replaced and all I have are 26 or 28 so one set is going on the new wheels. 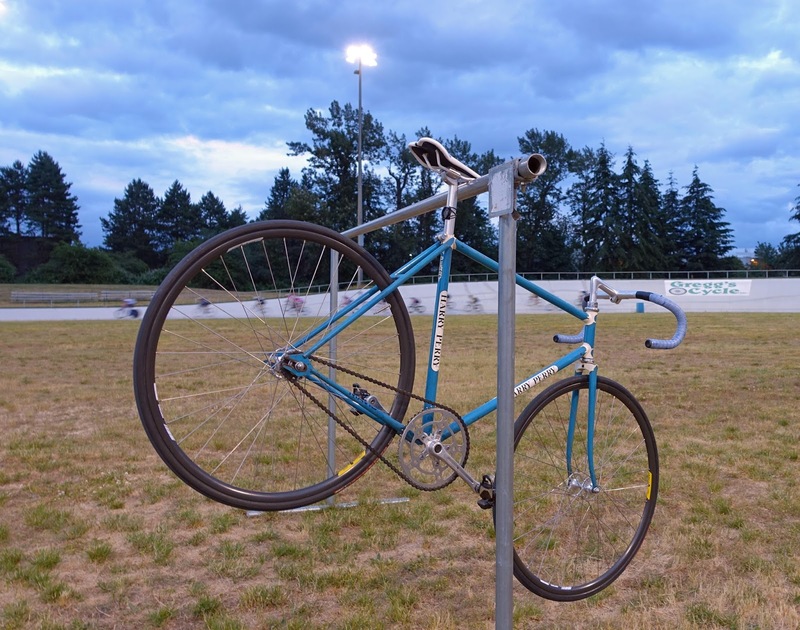 I would love to hear your thoughts on track bikes, wheels and equipment, just leave your thoughts in the comments.